"It's time, kid." 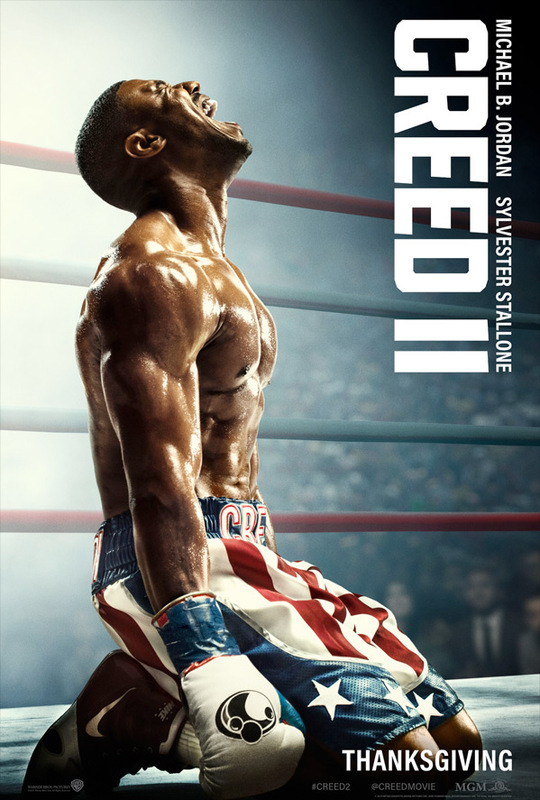 MGM + Warner Bros has revealed a second official trailer for Creed II, the sequel to Creed, the launch of a new series in the Rocky Balboa world featuring Adonis Creed. Michael B. Jordan returns to play Adonis again, this time getting ready to fight an even more challenging adversary - Viktor Drago, the son of Ivan Drago. Romanian boxer Florian Munteanu plays Viktor, with the two iconic old dudes back in their original roles - Sylvester Stallone and Dolph Lundgren. Stallone, who produced the film, also co-wrote the script and has helped develop this sequel following Ryan Coogler's film. The cast includes Tessa Thompson, Wood Harris, Russell Hornsby, Phylicia Rashad, & Andre Ward. The first trailer was pretty good, this one has more intensity and emotion. He looks seriously worried in that final shot. Bring it. You can still watch the first official trailer for Creed II here, to see even more footage from this sequel. Life has become a balancing act for Adonis Creed (Michael B. Jordan). Between personal obligations and training for his next big fight, he is up against the challenge of his life. Facing an opponent with ties to his family’s past only intensifies his impending battle in the ring. Rocky Balboa (Sylvester Stallone) is there by his side through it all and, together, Rocky and Adonis will confront their shared legacy, question what’s worth fighting for, and discover that nothing’s more important than family. Creed II is about going back to basics to rediscover what made you a champion in the first place, and remembering that, no matter where you go, you can’t escape your history. Creed II, or Creed 2, is directed by American filmmaker Steven Caple Jr., of only the film The Land previously as well as a few shorts. The screenplay is written by Cheo Hodari Coker and Sylvester Stallone, based on Coogler's characters. MGM & WB will release Creed II in theaters everywhere starting November 21st later this fall. Looking even better? Planning to go see it?